Now that summer is in full swing so is fresh basil. It is plentiful and if you don't have the space or desire to grow your own, it is relatively cheap to buy at your local farm stand. 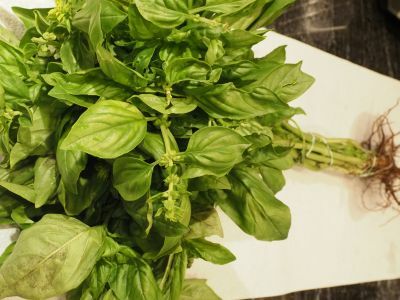 One of the most vibrant and popular ways to use all this basil is to make a quick and easy Basil Pesto. 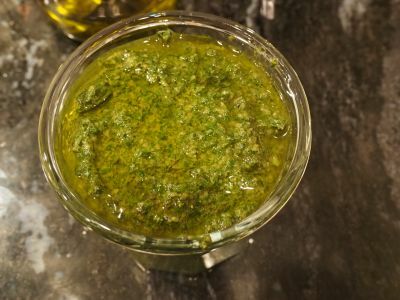 Try out this recipe and then visit How to Make Your Own Basil Pesto Recipe to add your touches to the dish. 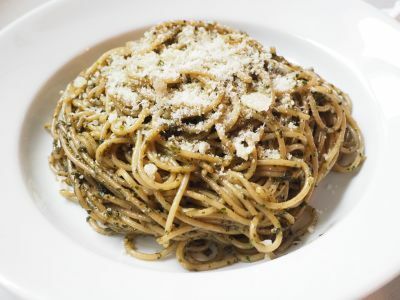 The star of the show here is basil and most often you add some garlic, pine nuts, Parmesan cheese, salt and olive oil. A good friend whose roots are Chicago Italian suggested to me one day that I should add some parsley in also. So I did and I really like it. I also like to add the cheese when I serve it for a couple of reasons. One, you can freeze the leftovers in the slim chance there are some. And two, I find some people like to control the amount of Parmesan they add. Ingredients are king here so don't skimp on the olive oil or the cheese. The olive oil should be a good quality extra virgin olive oil and the cheese should be freshly grated Parmigiano Reggiano. Enjoy! 1. Depending on how you got the basil, it is probably best to wash it. I like to use a salad spinner and actually soak it for about 30 minutes in cold water to make it nice and fresh. Since the basil I was using came from whole plants, roots and all, I washed it 3 times to make sure any and all dirt was out. 2. 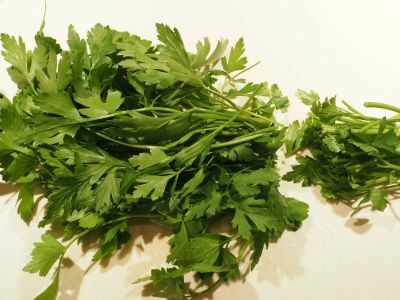 Remove the visible stems from the parsley and roughly chop it. 3. 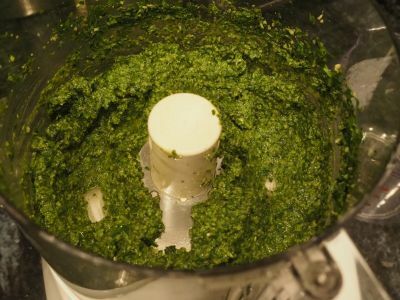 Add the basil, parsley, nuts, garlic and salt to a food processor (or blender). 4. Process until all the ingredients are chopped to a fine dice. 5. Start the processor again and add the oil in a slow stream until it gets to the desired consistency. 6. Store it in a container with a little olive oil poured over the top to keep it from browning if you are not going to use it right away. If you are using it immediately this step is not really necessary but if you have some left over you can do this and refrigerate it. 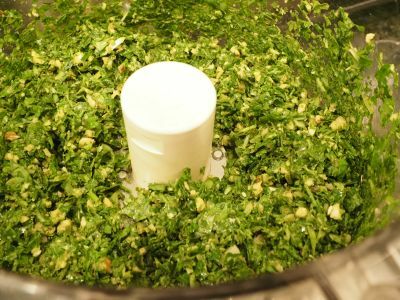 Cook and drain your pasta and mix the pesto in with the pasta in the pot. You can add some of the cheese at this point if desired. Serve and enjoy! Tommy, walnuts can go rancid and lose flavor and texture and chopped nuts are probably more susceptible to that. 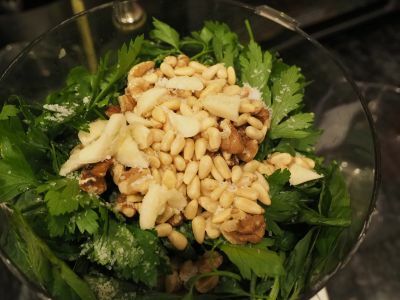 Not sure if you used pine nuts and walnuts or just walnuts but the pine nuts add a slightly different flavor. Anyhow try it again and let us know how you make out. I did this "general" recipe with thin spaghetti and brought in some seared scallops and jumbo gulf shrimp. It was unreal! I need to do it again though because, when I was in the grocery check out line, I noticed the little pack of chopped walnuts I had was outdated by a few months. Not sure if that would have impacted their profile but they felt like they were sticking together in the pack - as if their oil was releasing (Boston Sidewalks pls advise if that's a good thing!) Anyway, I didn't want to have to get back in line so went without walnuts! Therefore, I look forward to doing again!!!!! 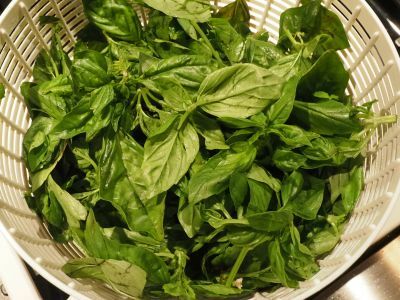 Eileen, if you don't have a food processor or a mortar and pestle or a blender I suppose you could chop the basil real fine and then use the back of a spoon (I think a wooden spoon would be best) in a wide mouth bowl like a wooden salad bowl. It will be some work but that should work about the same as a mortar and pestle. And yes, you can freeze pesto either in ice cube trays or small containers for later use. I wouldn't go much over 6 months but that is up to you and it may lose some color in the freezer. If you are going to store it in the refrigerator, put it in a narrow mouthed glass or jar and add a little fresh olive oil to cover the top and protect if from the air. Good luck! I will make this soon with basil from my little pot that is managing in the Houston heat , and I know it will be delish. Thanks for sharing!